Since I am a lover of books, I thought I would let you all know what I am reading. I read in spurts. Because my life can get a little crazy, I can go weeks without picking up a book. Then there are those times that every time I turn around I am on to a new book. 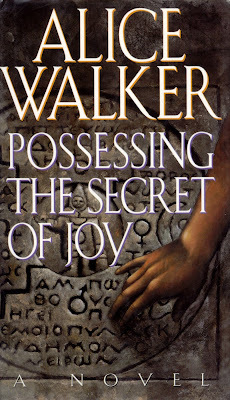 Anyway, this week I am reading Possessing the Secret of Joy by Alice Walker, the author of the Color Purple (just in case). From Library JournalA peripheral character in The Color Purple ( LJ 6/1/82) and The Temple of My Familiar ( LJ 3/15/88), Tashi becomes the focus of this welcome new work. Tashi, who marries Celie's son Adam, submits to female circumcision partially out of loyalty to the threatened tribal customs of her people, the Olinka. As a result, she endures physical pain and long-lasting emotional trauma. Not a sympathetically drawn victim, the tortured Tashi stretches to bridge two continents and to understand why women must undergo this torture, even at the hands of their mothers, for the pleasure of men. Though she often succumbs to madness, Tashi eventually takes possession of the secret of joy. Her compelling story is every Eve's account of those "whose chastity belt was made of leather, or of silk and diamonds, or of fear and not of our own 'flesh.' " This is not a sequel to Walker's previous novels, but it easily equals, if not surpasses, their excellence.-Faye A. Chadwell, Univ. of South Carolina Lib., ColumbiaCopyright 1992 Reed Business Information, Inc. --This text refers to an out of print or unavailable edition of this title. So far, I have to say that I am enjoying this read. I wasn't sure how I was going to feel about it because I, honestly, am not a big literary reader. I probably have read more literary novels than most but, I know, it is not nearly enough. I am working on that. Anyway, I will be back with an updated review. In the meantime, feel free to leave your comments about this book if you have read it.